Prior to the arrival of white settlers in mid-19th century, the Shasta people lived in the valley along Ashland Creek approximately where today's city is located. Early Hudson's Bay Company hunters and trappers following the Siskiyou Trail passed through the site in the 1820s. In the late 1840s, mainly American settlers following the Applegate Trail began passing through the area. By the early 1850s, the Donation Land Act brought many to the Rogue Valley and into conflict with its native people. These often violent clashes, known ultimately as the Rogue River Wars, continued until 1856. In 1851, gold was discovered at Rich Gulch, a tributary of Jackson Creek, and a tent city grew on its banks, today's Jacksonville. Settlers arrived in the Ashland area in January 1852, including Robert B. Hargadine, Sylvester Pease, Abel D Helman, Eber Emery, and others. Helman and Hargadine filed the first donation land claims in Ashland. Helman and Emery built a sawmill along what was then called Mill Creek to turn timber into lumber for settlers. In 1854, they and another settler, M. B. Morris, built a second mill, Ashland Flouring Mills, to grind local wheat into flour. The community around the mill became known as Ashland Mills. A post office was established in Ashland Mills in 1855 with Helman as postmaster. During the 1860s and 1870s the community grew, establishing a school, churches, businesses, and a large employer, Ashland Woolen Mills, which produced clothing and blankets from local wool. In 1871, the Post Office dropped "Mills" from Ashland's name. 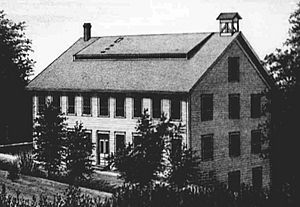 In 1872 Reverend J. H. Skidmore opened a college, Ashland Academy, a predecessor of Southern Oregon University. In 1887, Portland, Oregon, and San Francisco, California, were joined by rail at Ashland. Until 1926, when most rail service began taking a different route (east through Klamath Falls to avoid the steep grade through the Siskiyou Mountains), Ashland thrived on rail trade of local products, including pears, peaches, and apples. In 1908 the Women's Civic Improvement Club petitioned for the creation of community space along Ashland Creek, which became Ashland Canyon Park. The discovery of lithia water near Emigrant Lake around the same time led to a plan to establish a mineral spa at the park. Voters approved bonds to pay for the project, which included piping the mineral water from its source to Ashland. The town engaged John McLaren, landscape architect of San Francisco's Golden Gate Park, to design the park, renamed Lithia Springs Park, later shortened to Lithia Park. Although the park was popular, the mineral spa plans proved too expensive for local taxpayers and were abandoned in 1916. Meanwhile, entrepreneurs took to bottling and selling mineral waters from the area's springs. 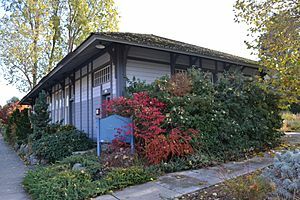 During the Fourth of July celebration in 1935, Angus L. Bowmer arranged the first performances of what would become the Oregon Shakespeare Festival. The festival grew during the 20th century, and has become an award-winning and internationally known regional theater company. Many of Ashland's historic buildings have been preserved and restored. The city has 48 individual structures and two historic districts (the Ashland Railroad Addition District and the Downtown District) on the National Register of Historic Places. The structures include the Enders Building (home of the Columbia Hotel), which from 1910 to 1928 contained the largest mercantile establishment between Sacramento and Portland. Ashland is at 1,949 feet (594 m) above sea level in the foothills of the Siskiyou and Cascade ranges, about 15 miles (24 km) north of the California border on Interstate 5 (I-5). About 10 miles (16 km) south of Ashland and 5 miles (8 km) north of the California border is Siskiyou Summit, which at 4,310 feet (1,310 m) is the highest point on I-5. 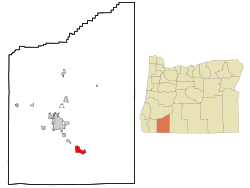 Ashland is about 12 miles (19 km) south of Medford and about 300 miles (480 km) south of Portland. According to the United States Census Bureau, the city has a total area of about 6.6 square miles (17.1 km2), all land. Ashland Creek and its tributaries begin on the flanks of Mount Ashland, at 7,533 feet (2,296 m) above sea level in the Siskiyou Mountains south of the city. Upstream (south) of the city boundary, these streams flow mainly through the Rogue River – Siskiyou National Forest. The creek flows through the city to meet Bear Creek, which roughly parallels I-5 along the east side of Ashland. Bear Creek, one of many streams in the Rogue Valley, flows generally northwest to join the Rogue River near Gold Hill, and from there the river flows generally west to its mouth on the Pacific Ocean. Oregon Route 99, running roughly parallel to I-5, passes through downtown Ashland. Oregon Route 66 enters Ashland from the east and intersects Route 99 near the city center. 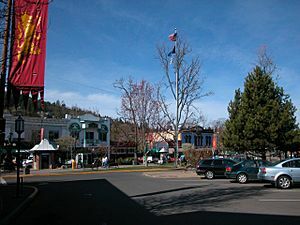 Ashland lies within Oregon's southwest interior climate zone, in which all but the higher-elevation sites are in the rain shadow of the Oregon Coast Range to the west. The largest urban areas in this zone in addition to Ashland are Medford and Grants Pass in the Rogue Valley, and Roseburg in the Umpqua River Valley further north. Although the mountain peaks in this zone receive up to 120 inches or 3,050 millimetres of precipitation a year, the urban areas and the valleys in which they lie generally get 20 inches (510 mm) or less. This valley climate is particularly good for growing fruit, especially pears, and for producing other crops and farm goods such as hay, grain, poultry, and beef. Cloud cover in nearby Medford varies from an average of 21 percent in July to 86 percent in December. On average, precipitation falls in Ashland on 114 days each year and totals about 20 inches (510 mm). The average annual snowfall is only 1.4 inches or 0.04 metres. The average relative humidity, measured at 4 p.m. daily, is 47 percent in Medford, varying from 26 percent in July to 76 percent in December. According to the Köppen climate classification system, Ashland has a warm-summer Mediterranean climate (Csb). The coolest month is December, with an average high temperature of 47 °F or 8.3 °C, and the warmest month is July, with an average high of about 88 °F or 31.1 °C. The highest temperature ever recorded in Ashland was 108 °F (42.2 °C), observed in August 1981, and the record low of −4 °F (−20 °C) occurred in December 1972. The wettest “rain year” has been from July 1926 to June 1927 with 29.77 inches (756.2 mm) and the driest from July 1954 to June 1955 with only 10.37 inches (263.4 mm). The wettest month on record has been December 1964 with 11.28 inches (286.5 mm), but the only other months with over 8 inches or 203.2 millimetres have been December 1996 with 10.89 inches (276.6 mm), November 1903 with 8.10 inches (205.7 mm) and November 1998 with 8.03 inches (204.0 mm). In the census of 2010, there were 20,078 people, 9,409 households, and 4,542 families residing in the city. The population density was 3,047 inhabitants per square mile (1,176/km2). There were 10,455 housing units at an average density of 1,587 per square mile (613/km2). The racial makeup of the city was about 90% White, 1% African American, 1% Native American, 2% Asian, 0.3% Pacific Islander, 1.4% from other races, and 4% from two or more races. Hispanic or Latino of any race were about 5% of the population. There were 9,409 households out of which about 21% had children under the age of 18 living with them. About 34% were married couples living together; 10% had a female householder with no husband present, about 4% had a male householder with no wife present, and about 52% were non-families. About 38% of all households were made up of individuals and 13.5% had someone living alone who was 65 years of age or older. The average household size was 2.03 and the average family size was 2.63. The median age in the city was 42.9 years. About 16% of residents were under the age of 18, and about 16% were between the ages of 18 and 24. Rounded to the nearest whole number, 21% were from 25 to 44 years old; 30% were from 45 to 64; and 18% were 65 years of age or older. The gender makeup of the city was about 46% male and 54% female. In 2010, the median income for a household in the city was $41,334, and the median income for a family was $58,409. Males had a median income of $50,368 versus $34,202 for females. The per capita income for the city was $28,941. About 21% of the population and 13% of families had incomes below the poverty line. Out of the total population, about 30% of those under the age of 18 and 3.5% of those 65 and older were living below the poverty line. The Oregon Shakespeare Festival has grown from a summer outdoor series in the 1930s to a season that stretches from February to October, incorporating Shakespearean and non-Shakespearean plays at three theaters. 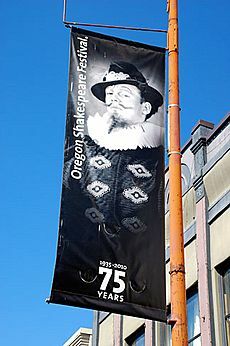 The OSF has become the largest regional repertory theater in the United States. The Oregon Cabaret Theater features musicals and comedy throughout the year. Opened in 1986, the dinner theater occupies a former First Baptist Church built in Mission Revival style. The Ashland Independent Film Festival, which shows international and domestic films of almost every genre, takes place each April in the Varsity Theatre downtown. About 90 films are shown during the five days of the festival. In 2009, Ashland was the setting for the movie version of Neil Gaiman's Coraline. The annual Ashland New Plays Festival (ANPF) is a nonprofit organization that encourages playwrights to develop new work through public readings. Each year, the ANPF holds an international competition that winnows hundreds of submissions to four plays that are read to live audiences by professional actors during a five-day festival in October. The National Fish and Wildlife Forensics Laboratory in Ashland is the world's only laboratory dedicated to solving crimes against wildlife. Using forensic science, experts at the laboratory help wildlife officers to investigate possible crimes against animals and to establish links between victims and suspects in cases that go to court. The laboratory has assisted the International Criminal Police Organization (INTERPOL) and foreign agencies concerned with the Convention on International Trade in Endangered Species (CITIES). The Ashland City Band (ACB) was organized in the late 19th century as the Ashland Brass Band. The band used an octagonal gazebo-style bandstand in Lithia Park until the Butler Memorial Band Shell was built in Lithia Park in 1946. The ACB gives public concerts there each summer between June and August. 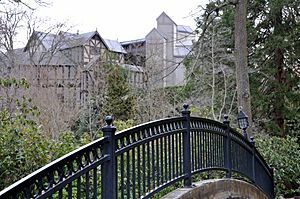 Lithia Park is a 93-acre (38 ha) park, including 42 acres (17 ha) on the National Register of Historic Places, that begins near the downtown shopping area and extends upstream along Ashland Creek near the center of the city. It includes two ponds, a Japanese garden, tennis courts, two public greens, a bandshell (outdoor stage) and miles of hiking trails. The name Lithia comes from natural mineral water found in the Ashland area. It has a strong mineral taste and slight effervescence, and the lithia water fountains found on the town plaza are frequently tasted by unsuspecting tourists (often at the behest of residents or frequent visitors who use the fountains as a cheap, humorous Ashland initiation rite). 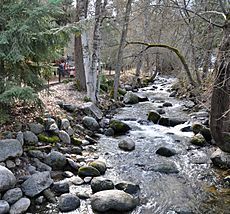 A hiking and biking path, the Bear Creek Greenway, begins in Ashland near the intersection of West Nevada Street with Helman Street, close to the confluence of Ashland Creek (which flows through Lithia Park). with Bear Creek. The 25-mile (40 km) path follows Bear Creek between Ashland and Central Point and passes through Talent, Phoenix, and Medford. Ashland, Oregon Facts for Kids. Kiddle Encyclopedia.